Rory Trahair at Edmiston & Company contacts me to say that Peter Jones in the London office has signed the 36.3m motor yacht _Necklace II _for sale. Necklace II was launched by Heesen in 2004 as Lady Ingeborg, the first in the yard's popular 3700 series. This superyacht's sleek aluminium hull gives her an excellent cruising range, while her bright contemporary interior accommodates 12 guests in five well appointed cabins. 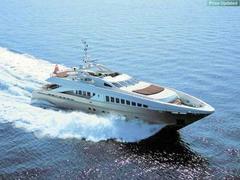 Lying in Palma de Mallorca , her 35m berth in La Napoule, France, is also for sale by separate negotiation. Necklace II is asking €9.3 million.